Registration for the 2018 International Forum is open. Please note, if you are already attending the annual conference you do not need to register. We are pleased to announce that our keynote speaker for this year is Dr. José Carlos Quadrado, Immediate-Past-President of LACCEI and Vice President of Instituto Superior de Engenharia do Porto. Dr. Quadrado’s keynote speech will accompany a networking luncheon, which will be followed by a panel session featuring prominent speakers in global engineering education. Details will be announced shortly. Anyone attending the annual conference will be able to attend the panel session free of charge. The networking luncheon and keynote speech is a ticketed event that can be purchased through the Annual Conference system. 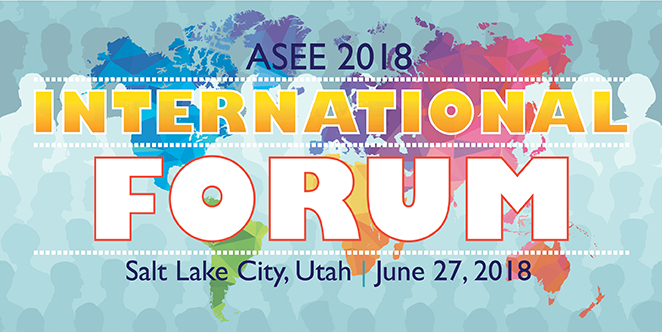 If you are not attending the Annual Conference, but wish to attend the International Forum, registration is available for $85 to ASEE members, $95 for non-members.